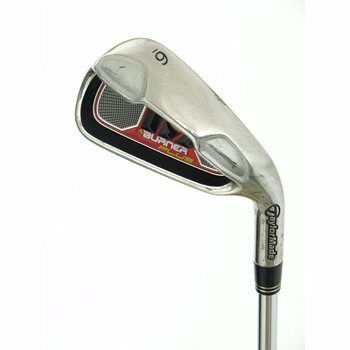 All / Men's Clubs / Right Hand / Single Iron / Used / TaylorMade / Burner Plus "CC"
Bargain Condition Men's Right-Hand TaylorMade Burner Plus "CC"
The TaylorMade Burner Plus irons feature a low and deep center of gravity and provide incredible versatility with wide, multi-functional, beveled soles. They also feature Inverted Cone Technology (ICT), which provides a higher Moment of Inertia resulting in higher ball speeds across a larger portion of the face for more distance on off-center hits. Power, forgiveness and playability are optimized throughout the set making the Burner Plus perfect for a wide variety of golfers. The irons feature a "c" stamped on the toe of the clubhead indicating that they have USGA conforming grooves.